Your Barber dime value is $1.91 to $2.23 for a common date coin in heavily worn "Good" condition. If your coin is better preserved the value increases to $19 and higher in "Extremely Fine" condition. However, the coin you are hoping to discover in your box is the 1895-O. Avidly sought by dealers and collectors, in Good condition it is easily worth $256 and quickly rising to $1,337 in Extremely Fine condition. To highlight a few more rarities, the 1892-S, 1901-S and the 1904-S are all worth at least $105 when found in nice condition. In fact many other dates have values of $20 to $30, and the better the condition of the coin the higher the value. Rising up the condition scale, any "Uncirculated" Barber Dime value is over $75 to $100 with many starting above $200. See more about condition and "Grading" your coins below. Discover the value of your coins. The dates, mint marks and conditions are listed on the value chart. Notice coin values increase dramatically, not only for certain rare dates and mint marks, but as the condition improves. The above chart represents wholesale coin values. Computed from dealer's price lists with various mark-up factors figured in. They reflect closely the value you would expect to receive when selling. Variations in value do occur subject to subtle grading points, collector demands and dealer needs. 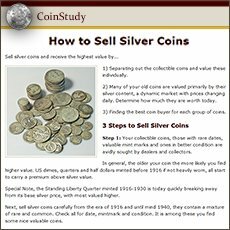 For more background information, see how value listings in the Coin Value Guide are determined. Dealers and collectors have a practiced and keen eye for spotting better condition coins. In doing so they categorize and "Grade" each coin. Realize a Barber dime value increases as the condition improves, often dramatically. Compare your coins to the grading images below. A coin in "Good" condition is worn almost smooth, LIBERTY on the obverse and the wreath on the reverse show, but with little detail. In "Fine" condition all the letters to LIBERTY show on the headband and the wreath shows some detail. Hopefully your dimes are crisp and sharp in detail. Collectors and dealers consider PCGS and NGC as leaders in coin grading services. They both authenticate and grade your coins. The small fee you pay provides assurance you understand and receive the full value of your coins. In depth video judging condition: Grading Barber Dimes... follow the step by step process and confidently grade the condition of Barber dimes. Rare coin dealers and auction sites are informative about coin values. Look for those offering Barber Dimes for sale, their listings and prices usually include a notation of the NGC and PCGS assigned grade. Additionally... these coin dealers are potential buyers of your coins. 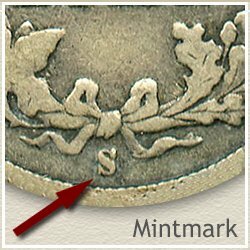 With a mintmark or without a mintmark, the difference often changes Barber dime values from $1.91 to $100. Let's use the year 1909 as an example. Dimes where produced in four locations throughout the county in 1909. The one you are hoping to find is the San Francisco coin, with the "S" mintmark. Check the coin values chart, $4.53 in Good condition rising quickly to over $120 in Extremely Fine condition. Locate all mint marks on the reverse under the wreath. The 1909 with the "D" mintmark, indicating the Denver mint, is a close second in value, $79 in Extremely Fine condition. The third possible mintmark, an "O" indicates the New Orleans mint and a 1909-O is a $44 coin in Extremely Fine condition. The most commonly found 1909 Barber dime was produced at the Philadelphia mint, using no mintmark, $1.91 to $19 dollars in value. 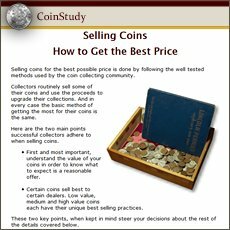 To help understand your coins and how popular and the value of certain Barber Dimes. Visit rare coin dealer's sites, look for and compare coins similar to yours. Consider your group of coins as the beginnings of a coin collection. Discover more about the collectible Barber Dime. Coin Collecting Guide for Beginners is packed with the info to start an enjoyable and rewarding hobby. If not, one successful approach is to sell all your coins and use the proceeds to purchase one nice rare coin. The one you were hoping to find in the box. Pass the thrill of a rare coin on to your children. Collectors push the Barber Dime value either up, or down. If there is rising interest in the series, up go the prices. Today involvement is high, with modern design changes, headlines of the latest record prices, all contributing to attract attention to coins. Your Barber Dime value is on the move. Keep in touch with coin values. Return here whenever curious and check on current values. Discover how much your old dimes are worth. Bust, Seated Liberty, to Barber, Mercury, and Roosevelt Dimes. Compare your coins to the Grading Images to judge condition and coin value charts. 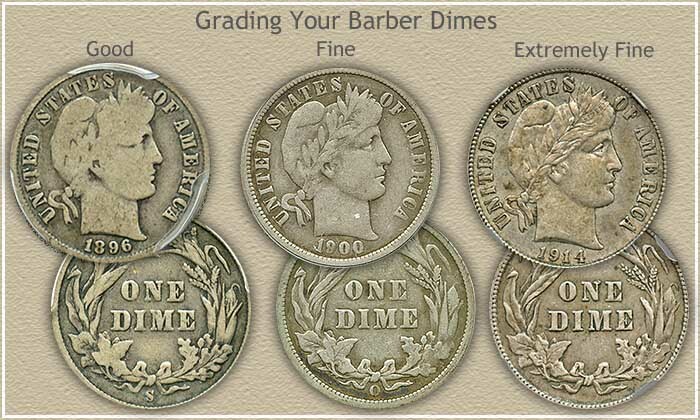 Judging the condition by grading your Barber dime is critical to understanding it true value. Many of these old dimes often double in worth if just slightly less worn than an average coin. How to video combined with close-up images and descriptions covers the process of grading. Print the handy Coin Values Worksheet to list your coins and record their values. Should you decide to sell... use the worksheet as an invoice and packing slip when sending coins through the mail to dealers. It indicates you have done your coin values homework.